Understanding what birds eat and the overall diet they prefer is essential to know what to feed birds to attract them to your backyard or where to look for foraging birds in the field. Every bird has different dietary preferences, and if you know what their different types of diets are, you can use those preferences to your advantage when birding. Click on any type of bird diet for a more detailed definition and examples of birds that prefer those foods. An avivorous bird eats other birds. 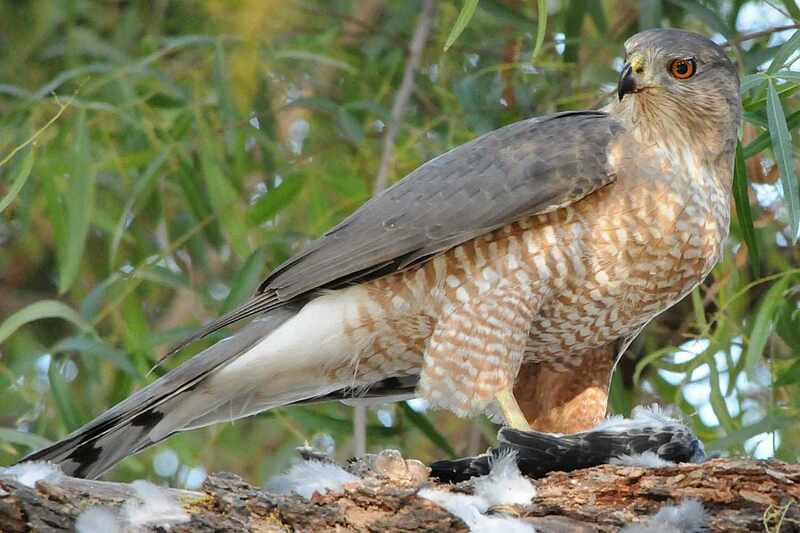 This is a popular diet for many of the smaller raptors, such as accipiters, which often prey on backyard birds. Several larger raptors will also prey on doves or pigeons. Red-tailed hawks and peregrine falcons in cities are top avivorous raptors since the pigeon populations are so abundant in urban areas. Large raptors may also take ducks or other waterbirds as prey when available. Carnivorous birds eat meat, including rodents, mammals, fish, amphibians, and reptiles. All birds of prey are carnivorous, as are many other birds including different shorebirds, corvids, and wading birds. A carnivorous bird may hunt and catch its own meat, or it could also prey on carrion. Vultures are carrion-eating carnivores, and many other birds will also sample carcasses as an easy meal. Frugivorous birds, or frugivores, are fruit-eating specialists. Orioles, waxwings, and toucans are all frugivorous and will eat fruit, berries and fruit-flavored jelly in the backyard. Many other birds will also sample fruit, including thrushes, grouse, quail, jays, wrens, tanagers and even some finches and sparrows. Many tropical birds also eat fruit. Frugivorous birds may be considered pests in orchards. A granivore eats primarily grains or seeds. Many birds are granivorous, including many sparrows and finches. These are easy birds to attract to the backyard with different types of birdseed. Planting seed-bearing flowers in the yard or opting for ornamental grasses are easy ways to provide natural foods for granivores. Many of these birds also eat large amounts of weed seeds or spilled grain in fields. Insectivorous birds are specialized carnivores that feed on insects, from gnats to mosquitoes to dragonflies. Flycatchers and warblers are insectivorous, and most birds will eat insects to feed hatchlings sufficient protein for healthy growth. Other types of birds that are primarily insectivorous all their lives include swallows, swifts, martins, dippers, and nighthawks. A molluscivorous bird feeds on mollusks such as snails, slugs or oysters. Many shorebirds are molluscivores and will forage at low tide for clams and oysters. Other molluscivorous birds forage in tidal flats or swamps. Limpkins are mollusk specialists, and many other wading birds and corvids also eat mollusks. A molluscivorous bird may drop its food from a great height to help crack tough shells, so the meat is easier to access. Bohemian Waxwing -- Fish Creek Park, Calgary 23 January, 2018. Mucivorous birds feed on the mucus of plants and trees, namely sap. Few birds are solely mucivorous, but woodpeckers, waxwings, kinglets, and warblers all have a mucivorous component to their diets. Birds may drill into trees to release sap to sip, or they may take advantage of larger wounds on trees to access sap with less effort. Other birds will pick insects out of sap, but don't eat the sap and wouldn't be considered mucivores. Hummingbird feeding from a flower. A nectivore feeds on flower nectar, and the most well known nectivorous birds are the more than 300 species of hummingbirds in the world. Other popular nectivores include honeycreepers and sunbirds, and nectivorous birds will visit both flowers and nectar feeders. Many other birds will also eat some nectar, including finches, woodpeckers, chickadees, and orioles. Black-headed heron eating a snake. An ophiophagous bird is a snake-eater, a specialized type of skilled carnivore. The snake eagle family of birds are ophiophagous, and the secretary bird is one of the most well-known snake-eating birds. Many larger wading birds, such as herons and egrets, will also eat any snakes they can catch. Raptors, including hawks and owls, will also catch and eat snakes. Few birds are strictly palynivorous, or pollen-eating. Many nectivorous or insectivorous birds will consume some pollen while foraging, however, even if it is an inadvertent snack. This can be critical to help pollinate flowers to encourage additional blooms that will replenish the birds' essential nectar supply. Pollen does provide some minor nutrients and minerals to the birds that consume it. Atlantic Puffin (Fratercula arctica) is a seabird species in the auk family - Mykines, Faroe Islands, 19 May, 2008. Piscivorous birds are carnivores that enjoy a diet of fish. The most well-known piscivore is the osprey, but other raptors, mergansers, and cormorants are piscivorous. Penguins, puffins and other aquatic birds are also largely piscivorous. Some of these birds may cause problems in sport fishing areas because they consume so many fish, and they may be culled if the problem is severe. Pair of Mandarins (Aix galericulata) -- Martin Mere, Lancashire, UK, 26 December, 2012. The term omnivorous describes the diet of many birds – eating everything and anything. Ducks are well-known omnivores, and many birds will at least sample other types of food even if they prefer one type of diet more exclusively. To be considered omnivorous, a bird should have a widely varied diet and eat all types of foods, rather than showing just a few strong preferences. More Birds Than Hummingbirds Will Visit Nectar Feeders! What Is White Proso Millet?